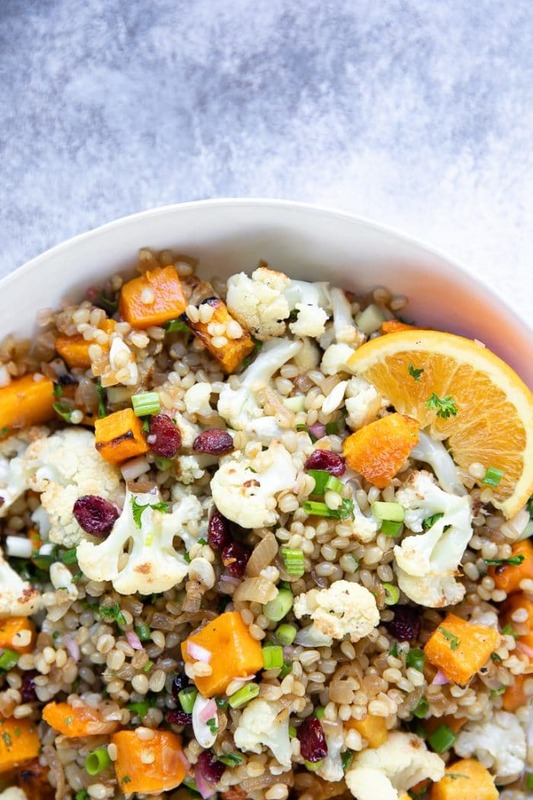 This Wheat Berry Salad with Orange Shallot Vinaigrette is fresh, healthy, and bursting with flavor. 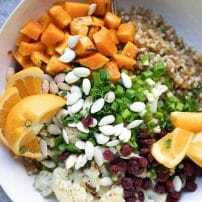 Filled with roasted butternut squash and cauliflower, sweet dried cranberries, fresh green onion, and crunchy pumpkin seeds, this Wheat Berry Salad can be enjoyed for dinner, lunch, or as a delicious holiday side. I love all salads. 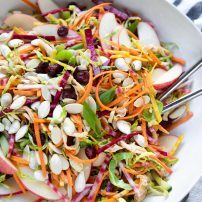 Crunchy green salads, noodle salads, fruit salads, potato salads, farro salads, chopped salads. They’re all delicious in their own unique way. So, when I discovered that I had yet to make a wheat berry salad, I knew I needed to fix this. Wheat berries are a relatively new addition to my pantry. 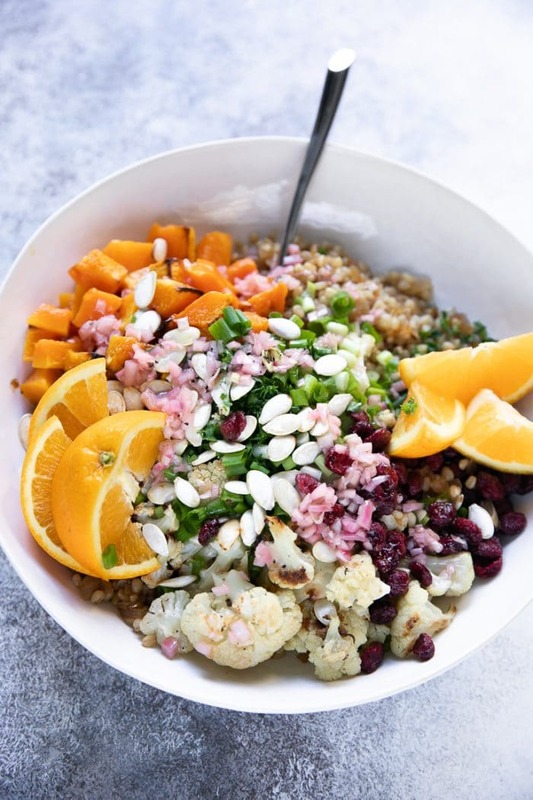 Somewhat harder to find in local markets, I ordered these wheat berries from Amazon and prepared this delicious, healthy, and highly versatile wheat berry salad with roasted butternut squash and cauliflower the following afternoon. If you’ve never tried wheat berries, they’re much like farro in texture, size, and taste, and taste fantastic in all kinds of salad, soup, and stews. Wheat berries are whole wheat kernels, except the hull/husk, and composed of the bran, germ, and endosperm. Often confused with other whole grains such as farro and spelt given their similar size, texture, and appearance. As I mentioned previously, I purchased my wheat berries on Amazon, however, given their rise in popularity in the past couple of years, they are becoming more widely available especially in bulk bins at health food markets (look for alternative names such as hard red winter wheat). Wheat berries may either be tan to reddish-brown in color. Not all wheat berries are alike. They vary by texture, color, and size, and are named after the season they are grown (spring versus winter), color, and gluten content. The most readily available wheat berries include red spring and winter wheat berries, which are chewy, high in protein and fiber, and brown in color. Red spring and winter wheat berries– used to make rougher flour and breads. Soft white wheat berries– starchier, these wheat berries are used to make pastry flour. 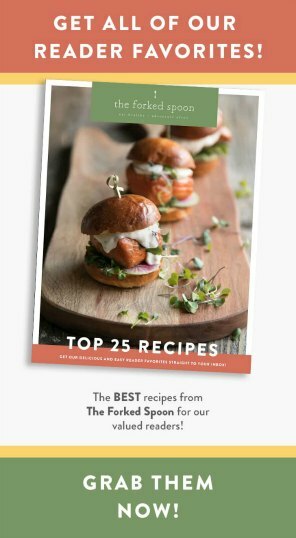 Whole versus pearled wheat berries? I recommend purchasing whole wheat berries. Unlike whole wheat berries, pearled wheat berries have been processed to remove the outer husk. 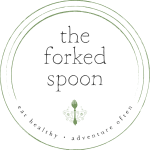 This makes cooking time faster, however, removal of the husk also removes much of the fiber. No. Wheat berries are…wheat. As such, they are not a gluten-free food. Delicious warm or cold, this Wheat Berry Salad is incredibly easy to prepare. The steps are simple, including several which can be prepared ahead of time. Prepare the wheat berries. Add the wheat berries to a medium saucepan and cover with 5 cups of water and a generous pinch of salt. Stir to combine. Bring to a boil and reduce to a simmer. Cook, uncovered until wheat berries reach desired doneness, approximately 25-35 minutes (I usually test how far along they are by pinching them between my thumb and middle finger. They should feel cooked, but not mushy). Drain and rinse with cool water to prevent further cooking. Line a baking sheet with parchment paper and spread out the wheat berries to cool completely. Set aside. Prepare the vegetables. Meanwhile, preheat oven to 425 degrees F. Line two baking sheets with parchment paper. 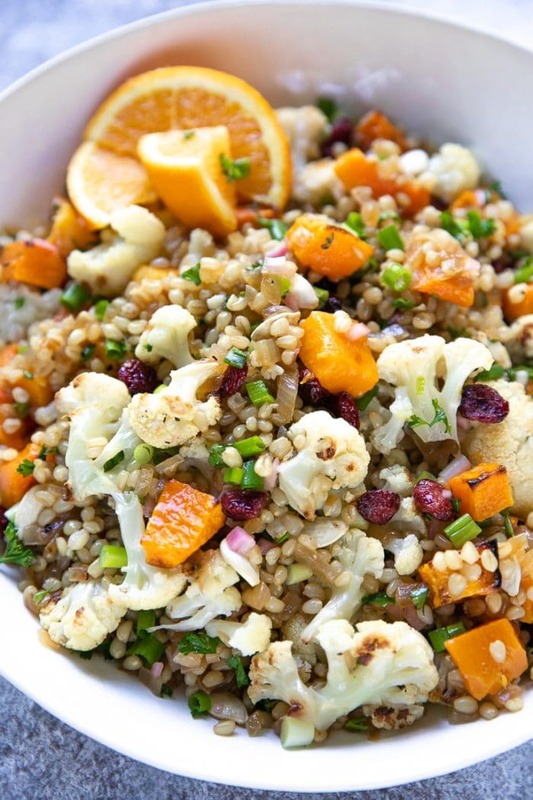 As the wheat berries cook, roast the cauliflower and butternut squash in the oven. Drizzle with olive oil and sprinkle with salt and pepper. Toss to coat. Roast the butternut squash and cauliflower for 20-25 minutes, or until tender and browning at the edges. Prepare the Orange Shallot Vinaigrette. Add all ingredients for the vinaigrette to a large mason jar. Shake vigorously to combine. Season to taste. Cook the onions. (optional step but adds loads of flavor) Heat a large skillet over medium-high heat. Add the final tablespoon of olive oil and the onion to the skillet. Saute the onions until soft and just starting to brown, approximately 8 minutes. Stir often. Remove from heat and allow to cool for 5 minutes. Assemble. Add the cooked wheat berries and the sauteed onions to a large salad bowl. Mix well to combine. 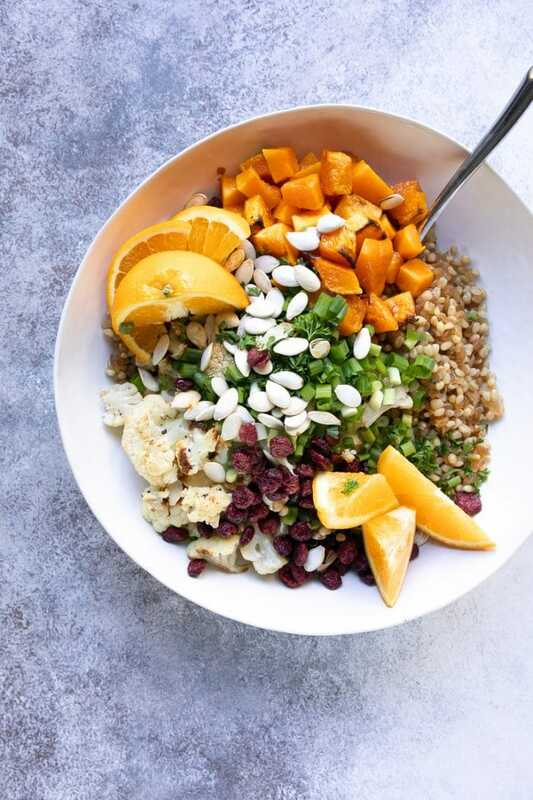 Add the roasted butternut squash, cauliflower, chopped green onion, parsley, dried cranberries, and pumpkin seeds. Toss well to combine. Drizzle with the prepared vinaigrette just before serving. What can be prepared ahead of time? For meal prep or holiday planning, I recommend preparing the wheat berries and the vinaigrette ahead of time. 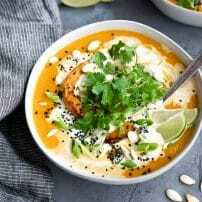 The butternut squash and the cauliflower may also be cooked ahead of time and reheated if absolutely necessary. 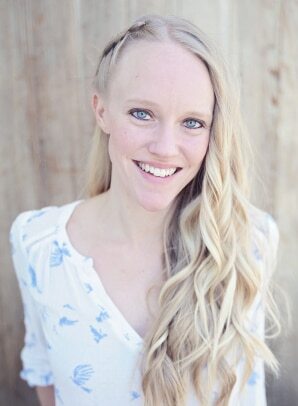 If you try cooking this Wheat Berry Salad Recipe, please leave me a comment and let me know! I always love to hear your thoughts. 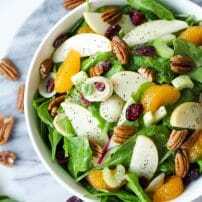 DON’T FORGET TO PIN AND SHARE THIS WHEAT BERRY SALAD WITH ORANGE SHALLOT VINAIGRETTE TO MAKE FOR A FLAVORFUL AND HEALTHY DINNER THE WHOLE FAMILY WILL LOVE. Prepare the wheat berries. Add the wheat berries to a medium saucepan and cover with 5 cups of water and a generous pinch of salt. Stir to combine. Bring to a boil and reduce to a simmer. Cook, uncovered until wheat berries reach desired doneness, approximately 25-35 minutes. Drain and rinse with cool water to prevent further cooking. Line a baking sheet with parchment paper and spread out the wheat berries to cool completely. Set aside. Prepare the vegetables. Meanwhile, preheat oven to 425 degrees F. Line two baking sheets with parchment paper. Transfer the cauliflower florets to one baking sheet and the butternut squash to the other. Drizzle with olive oil and sprinkle with salt and pepper. Toss to coat. Roast the butternut squash and cauliflower for 20-25 minutes, or until tender. Cook the onions. Heat a large skillet over medium-high heat. Add the final tablespoon of olive oil and the onion to the skillet. Saute the onions until soft and just starting to brown, approximately 8 minutes. Stir often. Remove from heat and allow to cool for 5 minutes. Assemble. Add the cooked wheat berries and the sauteed onions to a large salad bowl. Mix well to combine. 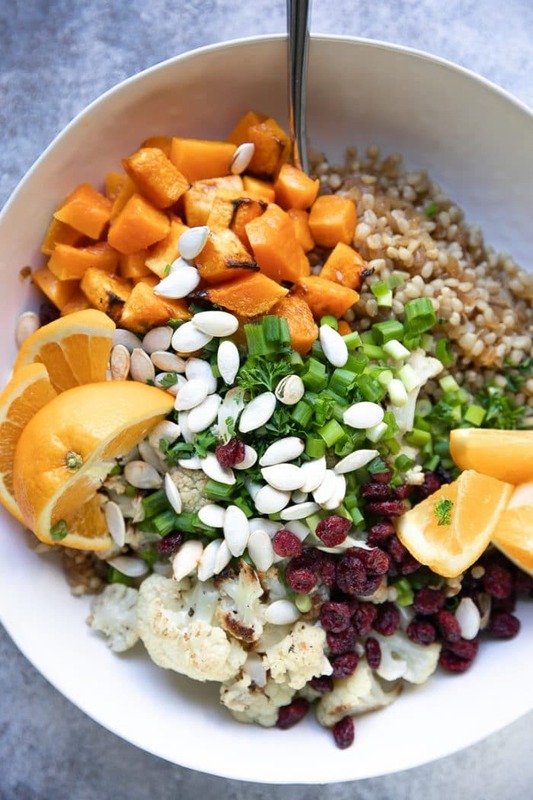 Add the roasted butternut squash, cauliflower, chopped green onion, parsley, dried cranberries, and pumpkin seeds. Toss well to combine. Drizzle with the prepared vinaigrette just before serving. Enjoy! I used soft white wheat berries in this recipe. If you cannot locate these, feel free to substitute with hard red spring wheat berries.